Autumn has definintely set in now. It's getting colder, damper and many patients report an increased craving for warming, starchy foods. The cold and flu viruses are creeping up and it's time to boost the immune system. 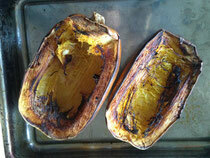 I love roasted pumpkin and squashes, they are nature's autumn and winter treats. A friend of mine grows some spaghetti squashes for me specially on his allotment, but you can use any pumpkin/squash for this recipe. Some veg suppliers also have them at the moment! Pumpkins are some of our superfoods, they are full in beta-carotenes (a powerful antioxidant), fiber, B Vitamins, Magnesium and Potassium. Cut pumpkin/squash in half, remove seeds, drizzle some good quality olive oil over it, add some salt and chopped up garlic in the hole where the seeds were. Place on baking tray, at 200C bake for 45-60 minutes- depending on size. To check if it's ready, pierce with a fork and it should feel soft all the way through until you hit the skin. Roasting pumpkin and squashes like this gives them a wonderful full flavour, which blends well with some of the stronger antiseptic herbs and spices. 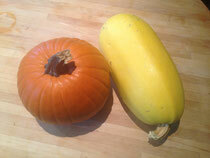 The spaghetti squashes in the picture were roasted for 55 minutes. Let them cool a bit, then scoop out the flesh, mix in a bowl and add on more cloves of freshly chopped garlic and herbs and spices. Garlic is an excellent antiseptic and therefore a welcome addition to any immune boosting recipe. Use generously, but caution when using raw as it can irritate the stomach. 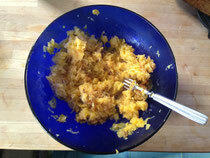 Spaghetti squash, or the lighter flavoured squashes are excellent with sumac, an interesting Middle Eastern spice, which adds a slightly sour, lemony flavour. It is a popular spice, which has traditionally been used for medicinal purposes as an astringent and a cooling agent to help treat fevers and urinary infections. The culinary dosage is often not enough to achieve its full medicinal property, but small amounts can have an accumulative effect if taken over time, and when combined with other medicinal herbs. 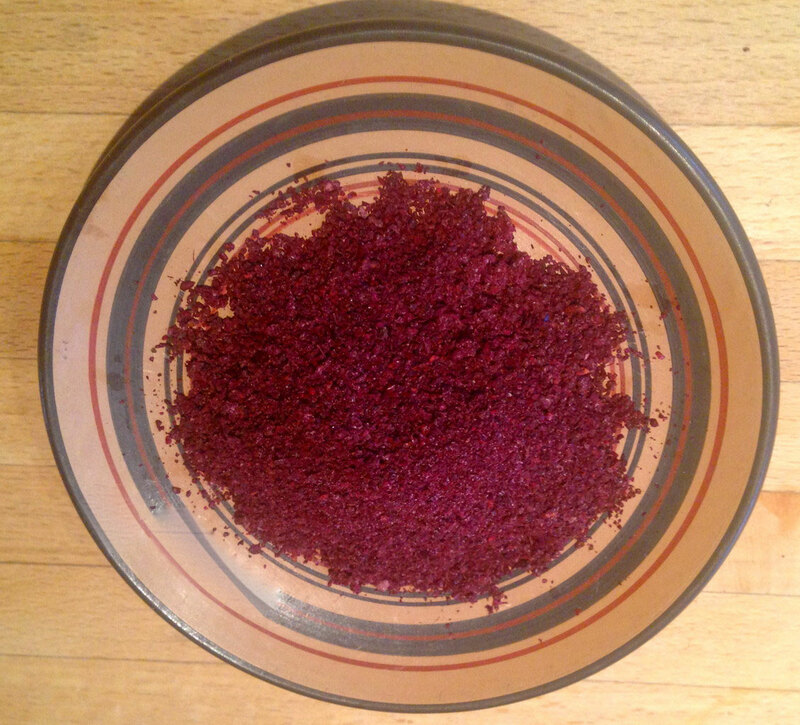 Sumac was a highly desirable spice throughout the centuries. I discovered this courtesy of the author Jonathan Digby, whose character in his Elizabethan Detective novel, 'A Murderous affair", is granted a special licence to import Sumac by Elizabeth I. Jon based this character on the real-life Dr Lopez, a Portuguese doctor at the Elizabethan court, who, in 1589, was granted the sole licence to import the highly desired sumac into England. Unfortunately, Dr Lopez's luck was short-lived as he was found guilty of treason for plotting against Queen Elizabeth and later executed. 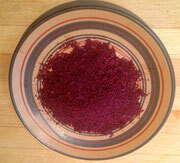 Use 1 to 1 1/2 teaspoons of Sumac powder (depending on size of pumpkin) and 1 to 2 teaspoons of finely ground rosemary or thyme. Both are wonderfully antiseptic and improve digestion. Add the fresh garlic, leave to cool for a few more minutes and serve. Other good spice/herb combinations I have tried before are powdered ginger and ground coriander mixed with a bit of fresh/frozen coriander leaf. This goes well with butternut squash. Ginger is an excellent circulatory stimulant and helps to keep hands and feet warm. For dark orange squashes, which are often much sweeter, a combination of 3/4 tsp of cinnamon, 1 tsp thyme and 1/4 tsp sage is very nice. Cinnamon is warming but also helps to stabilise blood sugar levels if taken in large enough quantities. Keep in the fridge for 3-4 days. Reheat before use. Serve with a 1 1/2 teaspoons of pine nuts per serving to give it a crunchy texture and to add essential fatty acids and some protein. Thinly sliced almonds combine well with sweeter pumpkins. 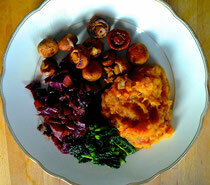 Served here 'ala' rainbow principles (aim to have all colours of the rainbow on your plate) with some steamed Cavalo Nero (dark green cabbage - any dark green vegetable will be fine), Garlic & Lemon Mushrooms and Balsamic Vinegar & Cumin Sauteed Red Cabbage. And don't throw away your seeds.. they make a tasty snack which can be kept for a few weeks. I liked the recipes here.